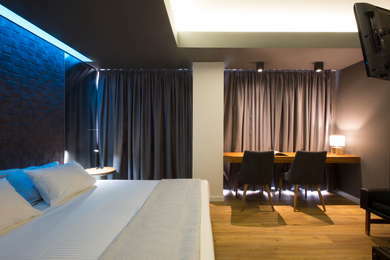 Since opening its doors in 2016, this small hotel created on the site of a software firm has amassed its rightful amount of accolades including the 2017 Best City Hotel award (in Greece). The concept of a micro-luxury boutique hotel (in essence a high-end Bed and Breakfast) is relatively new in Greece, but Pi is a perfect example: just 6 suites, of varying sizes, many of them on individual floors and offering an Acropolis view, a small indoor garden, a big community sitting area, a breakfast area, a roof garden overlooking the Acropolis, the National Gardens, and the Panathenaic Stadium, and a private parking area. YOU SHOULD KNOW Tucked away on a side street to the Panathenaic Stadium, this hotel is not tourist-central. However, the walk to the center offers a rare glimpse of green space, elegant parks, and open horizon, a valuable offering in crammed Athens. Every room has its own unique style. The recurrent theme is an efficient and relaxing minimalism, with some stylish details (for example a vintage, rotary dial phone). Some suites take up a whole floor, some others have more petite proportions. 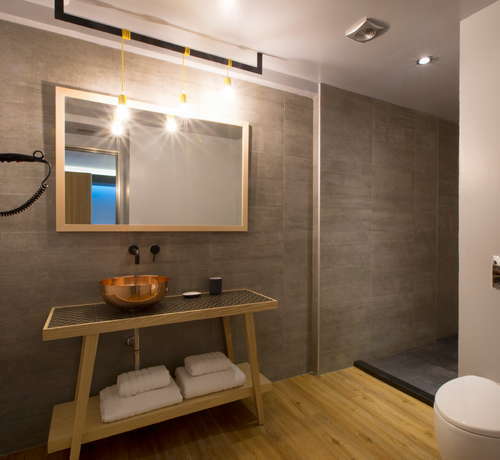 A stand-alone bath oozing old English style is comfortably nested next to a design towel rail and accentuated by modern spot lights; you can find it at the Acropolis View Suite (floor 4). Light and uncluttered, Pi’s lobby offers large communal spaces. There is a small olive garden as a tribute to the stadium’s heritage while the hotel facade and the lobby are both made from the same type of white marble that the 2,500 old stadium next door boasts. The basement of the building is a large 100 square meter area with natural light from glass elements that includes a large teak table, dining tables, and a large relaxing sofa. This is a breakfast room in the basement, and the whole idea is a bit DIY. Breakfast is included in the price and all products are high-quality, such as croissants, Greek yogurts, fresh orange juice, omelets, etc. YOU SHOULD KNOW You may get to squeeze the juice, but the fluffy omelettes will be prepared for you. The almost mandatory roof terrace with an Acropolis view exists here as well, so take a break from the hustle of city life and just relax. Do bring your own drinks though! If you have a car, Pi Hotel offers free valet parking for the duration of your stay. The bus stop is just at the end of the road (2-minute walk) and you can ask for directions at reception. The metro stop is not very close and you will probably need to take a quick taxi ride from the metro stop (Syntagma) if you are carrying lots of luggage. Taxi is a good affordable alternative. Socratis, the friendly owner of the hotel will happily direct you to Black sheep (5-minute walk) (tomauroprovato) restaurant offering Mediterranean dishes, while taverna Vyrinis (10-minute walk) is one of the oldest ones in Athens and offers a hearty, home-cooked meal. Katsourbos (1-minute walk) is a Cretan Cuisine restaurant in Athens at Proskopon square. A quick walk up the pedestrianized path next to the stadium takes you to the Chelsea Hotel (10-minute walk), a trendy all-day café bar serving delicious coffee, and across the square, Arbaroriza (8-minute walk) offers ouzo cocktails and a version of a margarita with Cretan anise-flavored raki instead of tequila. It is quiet, exclusive, clean, and has the personal touch of its energetic owner. Ideal for families, business travelers and longer-term residencies, for which you can negotiate a special rate.